Otis here. I’m wriggling my bottom with excitement to introduce you to Elton. Elton is our CTO—Chief Toy Officer. Elton helps test our toys, so Chopper and I can take breaks from play to guide the company. He’s not quite one year old. He brings a youthful perspective to our toy testing. Elton is a French Bulldog whose birthday is weeks away. An indoor dog for most of his early life, he’s been adventuring with his parents over the summer. Puppies learn the ways of the world through play. Besides sleeping, eating and more sleeping, Elton’s favorite activity is playing. As our main toy tester, Elton has a master’s degree in play. Elton is also a Pittsburgh native. Go Steelers! Elton lost the last of his baby teeth a few months ago, meaning he’s been through the teething puppy phase more recently than my brother and me. Teething usually starts around eight weeks and wraps up around six months of age. A puppy’s razor-sharp baby teeth are replaced by 42 permanent chompers. Elton made it through the teething phase with some choice puppy toys and very understanding parents. Teething hurts. Pups like to chew to ease the discomfort. It’s important to give them something firm yet flexible. No brittle toys that could injure gums allowed. 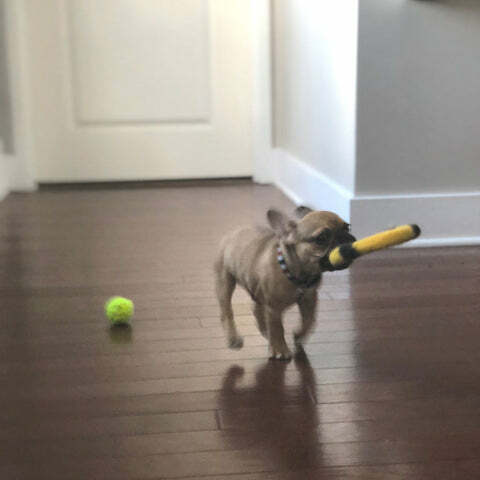 Toys should be right-sized for puppy mouths and durable. Always supervise play. Inspect toys for missing pieces or breaks. Replace any toys that could lose pieces to your enthusiastic chewer. Elton had three favorites to help him through his teething time. Cycle Dog’s Retreads Turtle— It’s mouth-sized, rubbery and easy to clean. The Busy Belly can be filled with homemade pupcicles (Recipe Here), providing a tasty treat while teething. 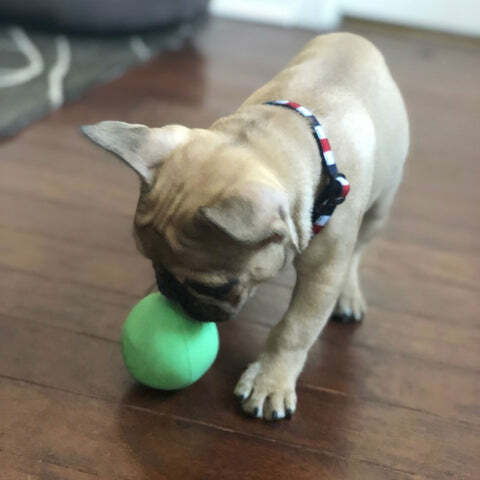 Beco Pets’ Beco Ball— Wobbly, chewy and made from natural rubber and rice husk fibers. The hidey hole can hold little snacks to reward your chewer. Le Sharma’s Eco Ring— Exercises the jaws and soothes the gums. Made from boiled wool and natural dyes, you don’t have to worry about your pup ingesting toxins while gnawing on this softer toy. Remember that toys are meant to be played with (and destroyed) so your pup doesn’t turn his attention to your belongings for rough play. It’s far better to replace a toy than try to find another pair of special edition sneakers. We’re very happy to have little Elton on the Chopper & Otis team!